Home>What exactly does an Osteopath do? I COULD give a standard explanation that we treat musculoskeletal conditions using massage and manipulation, but that really doesn’t go anywhere near an explanation of what I do in an average day. So here is MY average day and how the patients responded to their treatment. I have simplified the stories to make it easier to read. 9.00 am Treated a gentleman with an acute back pain caused by reaching over to pick up a lawn mower. He was bent over to one side and couldn’t stand for very long, or sit comfortably. No sciatica, no red flags. Treatment consisted of massage and manipulation with advice about using ice packs regularly and taking NSAIDs to reduce the inflammation. I also told him how to put a pillow between his knees to help him sleep more comfortably at night. 9.30 am Lady with a stiff, painful neck caused by carrying heavy bags while walking 30 minutes home from the shops. She has already had treatment for some arthritis in her neck, so manipulation was not appropriate in her case. Treatment: massage, ultrasound, gentle traction and stretching exercises. 10.00 am Lady with back pain and sciatica in the right leg.The back pain eased with manual work, but the sciatica was still a problem. Treatment: Medical Acupuncture and electrotherapy to help reduce the pain. Advice on exercises and ice packing. 10.30 am Gentleman with pain over his right loin and lower ribs. On examination he was in a lot of pain and was very tender over the kidney. On testing his urine with a Multistix kit, he was found to have a kidney infection. I wrote a letter for him to take to his GP for further tests and medical treatment. 11.30 am Young lady complaining of a long history of neck and knee pains. On examination she was found to be hypermobile (double jointed). Tested using the Beighton Score. She scored 7/9. Hypermobility syndrome can cause a wide variety of symptoms such as asthma type lung problems, IBS type symptoms, stretch marks, bruising easily, poor response to dental anaesthetics, an increased risk of migraines, poor healing, pelvic pains in pregnancy, fatigue and anxiety. The patient was given information about the hypermobility.org website and told where to find a good Pilates instructor who is trained in teaching hypermobile clients. Manipulating hypermobile patients can make the condition worse, so I treated her with massage, advice on exercises and how best to manage her hypermobility. 2.00 pm Lady with pain and limitation of movement in the shoulder. I arranged for an MRI scan and it was found to be a torn tendon that needed surgery. I gave her Osteopathic treatment to manage the pain and enable her to keep working until the operation was due. Treatment on this occasion: Low-Level Laser, massage and advice to help her prepare for surgery. We will be continuing treatment to encourage her post-operative recovery. 3.00 pm Gentleman with pain under the left shoulder blade after hedge trimming. The pain had been so severe that he’d gone to A&E with a suspected heart attack. He was given the all clear and was told it was just a pulled muscle. I found strained rib joints of his 4th and 5th ribs and did some massage and Osteopathic manipulation. The acute pain eased almost immediately and he was better a few days later. 4.00 pm Gentleman with neck pain and headaches. His scans showed very severe arthritis in the neck, and we spent some time going through the scan images together, so that he could understand what was happening in his neck, and what was causing his pain. This was not a condition that could be cured, but I hoped we might be able to ease some of the pain. 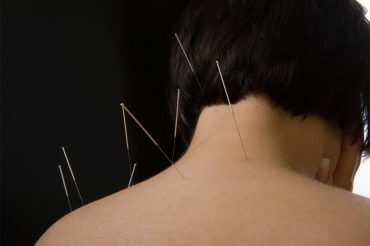 He was happy to try and, after contacting his GP to explain what we were doing, I used a combination of Medical Acupuncture, Low-Level Laser and Ultrasound, massage and cervical traction over several treatments. The pain had eased a little, but after 6 treatments it had reduced from severe to bearable. He was due to see a pain specialist but there is a long waiting list, so I am making him as comfortable as possible until then. 4.30 pm Lady with painful, arthritic knees. As she is too young to have a knee replacement at this time, I have been working to reduce the pain and enable her to walk and live as normally as possible. Treatment: Advice and encouragement on getting her weight down. Knees are very sensitive to weight bearing and any excess weight will aggravate knee pain. Using soft orthotics can reduce the shock absorption through the knees and good footwear also protects them. It is important to keep patients with knee problems walking daily for their general health and circulation benefits. If the muscles are strong and they are relatively fit, they will recover better from surgery when they need it. I used Low-Level Laser and ultrasound to reduce the knee pain; and massage to the buttock, hip and thigh muscles to reduce the postural strain from walking badly due to the knee pain. I worked on her knees, hips and spine to improve the mobility of the joints and to reduce the stiffness. So that’s a typical day, for me. My work is very varied, and I try to help patients with their whole lifestyle and health, not just treating their back or neck pain. Other Osteopaths may work in different ways, we all work slightly differently. This is why Osteopathy is the best job in the world: it’s varied, challenging and hugely rewarding. I consider myself to be very fortunate.